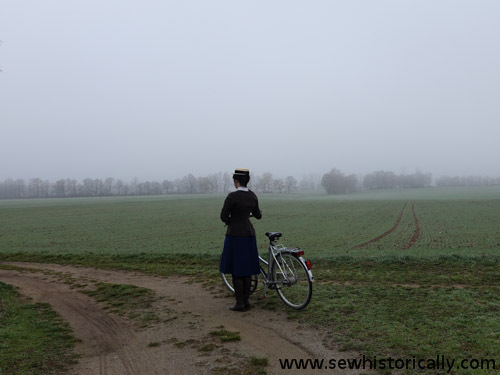 Some pictures of my fin de siecle cycling suit which I’ve sewn some years ago. 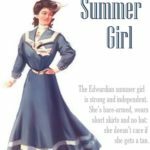 An Edwardian cycling costume resembles a tailor-made costume made of tweed or plain cloth: ‘it seems that the favourite costume for country riding will be knickerbockers and gaiters, while the skirt will of course prevail for town wear’ (1895 advertisement for a tailor-made cycling skirt costume). 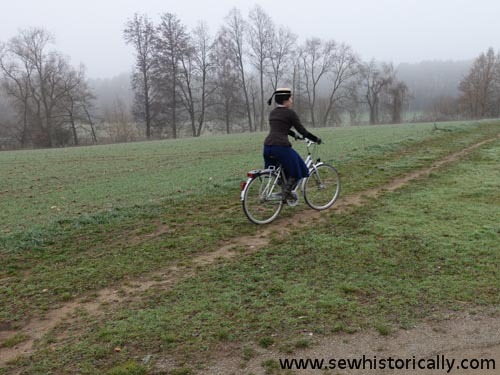 My inspirations were: 1898 woman’s bicycling ensemble with brown wool jacket with soutache braid, 1896 brown wool cycling suit and 1899 drawing of a woman in cycling costume with boater hat. For the cylcing jacket I used brown wool or a wool-blend fabric from my stash. I hadn’t enough of the fabric so I added long black cotton velvet cuffs. 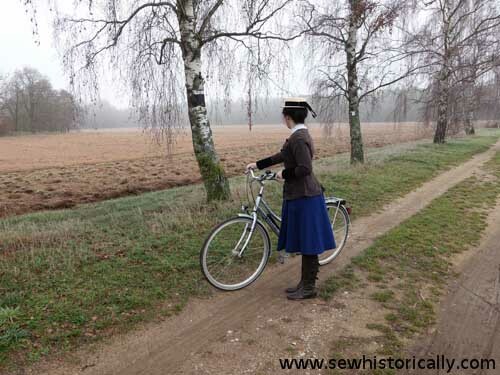 The front of the cycling jacket and sleeves are braided in military style, like these 1890s military styled ladies’ jackets. Here’s a ca. 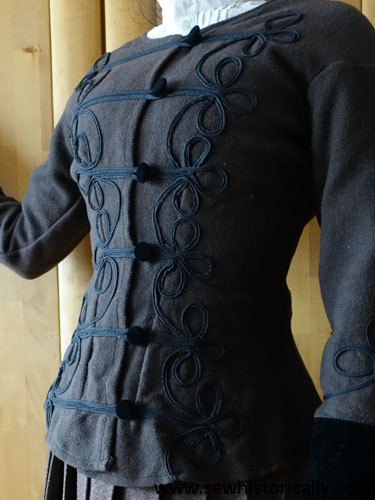 1890s black velvet jacket with soutache braid trim, a Victorian black wool riding jacket with soutache and an 1880s red wool coat with black soutache trim. 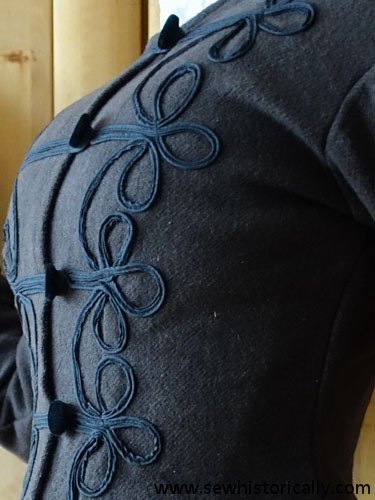 I made my own fabric soutache braid for the jacket: I cut long strips of thin black lining fabric, joined them together, folded them three times (so that all raw edges are hidden) and stitched down the center to secure the layers. 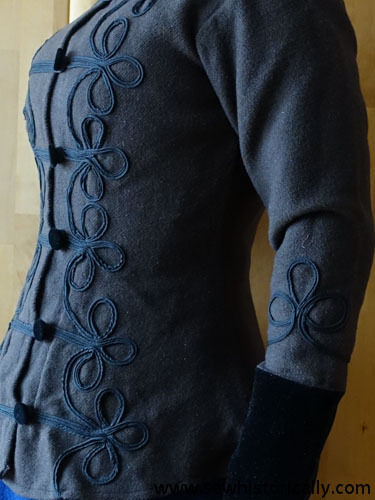 Then I formed loops, pinned the fabric soutache to the jacket and used my sewing machine to stitch it down. Here’s a picture of a similar fabric soutache (in the middle of the page). 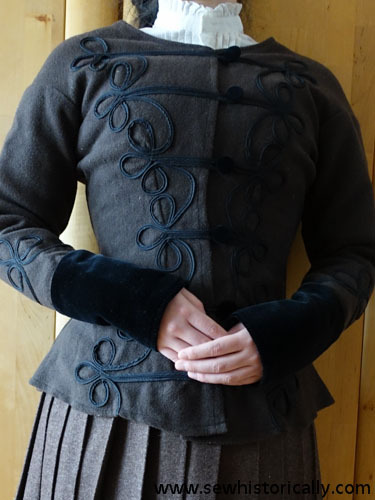 I covered the buttons with the same black cotton velvet to match the cuffs. The jacket has princess seams at the back. 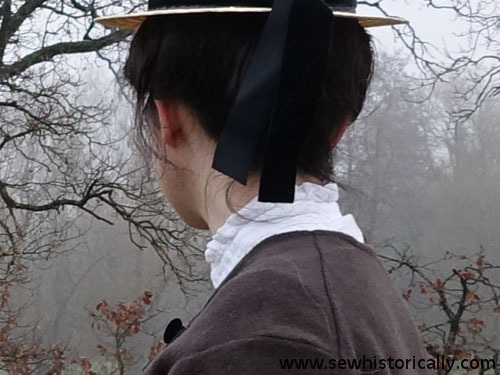 The sloped shoulder seams are more at the back of the jacket, which is typical for Victorian and Edwardian bodices. … and a blue skirts with two front double box pleats which I’ve sewn myself. 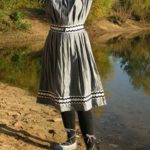 It’s made with a thick, warm, heavy blue wool or wool-blend fabric from my stash. Here’s a ca. 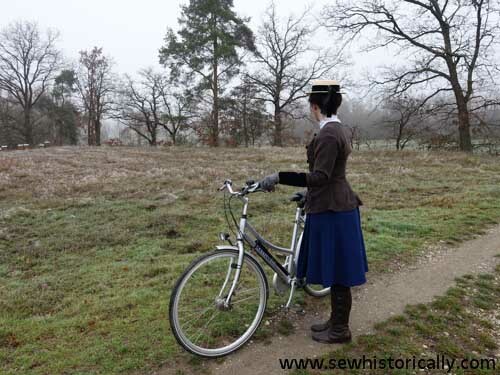 1895 cycling outfit with brown jacket and blue bloomers. 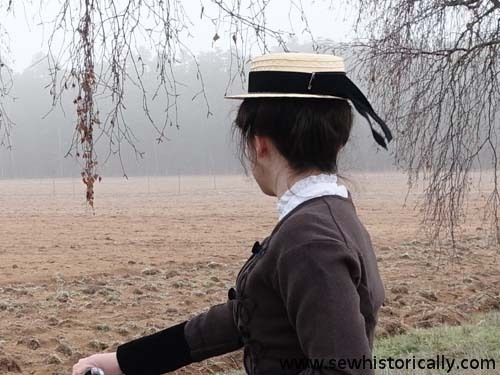 I’m wearing my straw boater hat with the Edwardian bicycle costume. 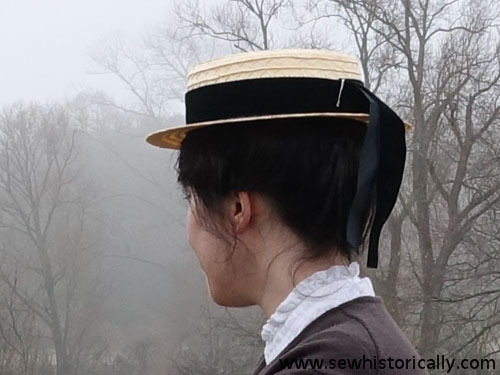 I trimmed the boater hat with black velvet ribbon. 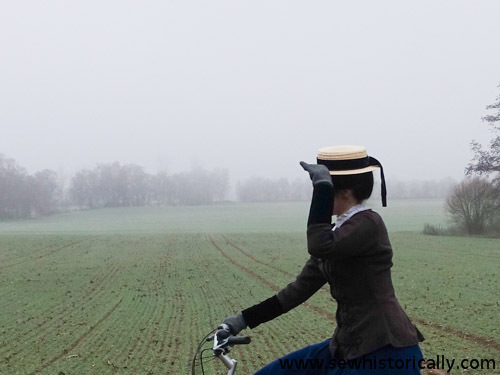 Here’s an 1899 photograph of a woman in cycling outfit with boater hat. 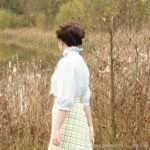 Beneath the cycling jacket I’m wearing my upcycled Victorian-style cotton blouse. I’m also wearing a flannel chemise and corset underneath. 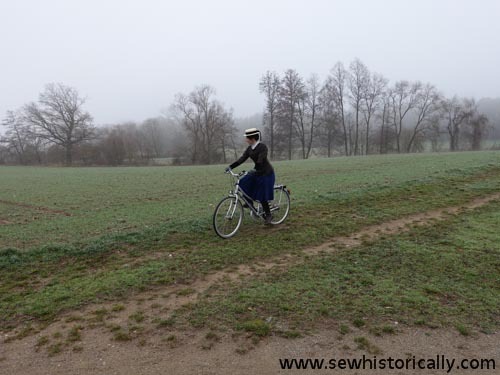 ‘I want to suggest that bicycle riding is a most energetic form of exercise, and that one becomes quickly heated by it even on a cool day; therefore, the wearing of underclothing of light flannel, which readily absorbs perspiration, is most important’ (The Book Of Athletics And Out-Of-Door Sports, 1895). Here’s an 1896 advertisement for a cyclist and athletic corset (in the middle of the page): ‘Perfect freedom combined with […] shape and gracefulness’. 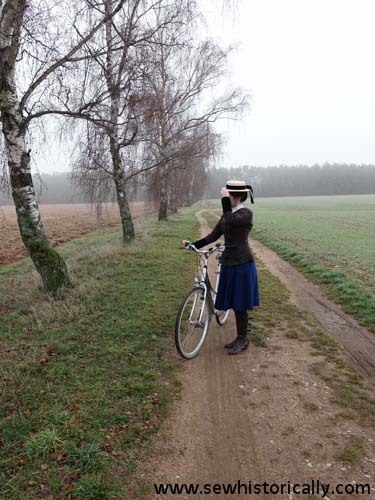 And I’m wearing brown leather boots: 1890s brown leather and cotton cycling boots, 1895-1900 brown leather cycling shoes. 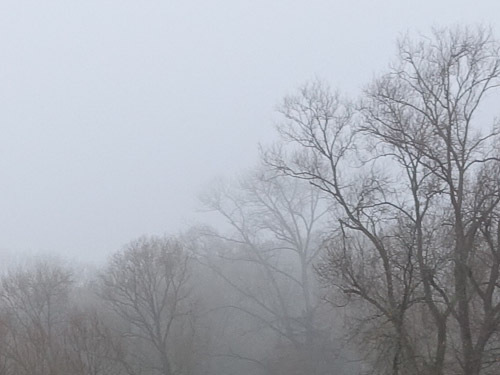 It was such a foggy day when we took the photos. 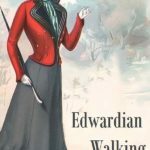 Writing in 1897, an author who had a ‘mania for flying […] was much impressed a few years ago when some one said to me: “If you want to come as near flying as we are likely to get in this generation, learn to ride a pneumatic bicycle.” […] A bicycle is better than a horse to ninety-nine men and women out of a hundred, because it costs almost nothing to keep, and it is never tired. It will take one three times as far as a horse in the same number of days or weeks. 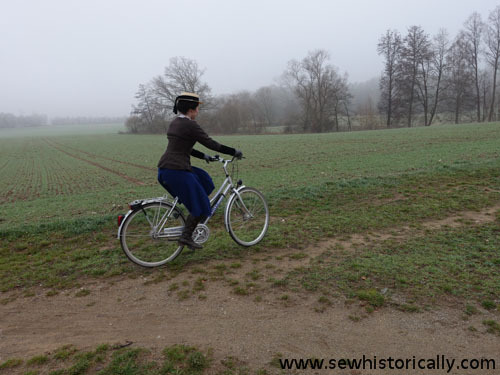 In touring with a bicycle I can make fifty miles a day as comfortably as twenty miles on foot; and I can carry all the clothing I need, besides a camera and other traps. The exercise is as invigorating as walking, or more so, with the great advantage that you can get over uninteresting tracts of country twice as fast as on foot. In fact, as any bicyclist knows, walking seems intolerably slow after the wheel’ (The Out Of Door Library: Athletic Sports, 1897b). I was surprised to read that there were already aluminium and bamboo bicycles (The Out Of Door Library: Athletic Sports, 1897c), and motor bicycles (The Out Of Door Library: Athletic Sports, 1897d) in the 1890s. 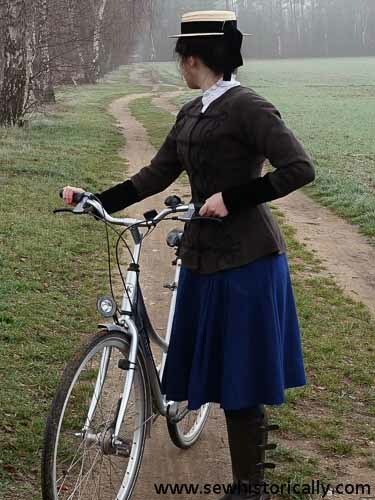 My cycling costume is similar to the outfit which was advised in the Edwardian era to wear for a walk in the rain (in the middle of the page). The photos are fascinating, but don’t you get hot wearing all that stuff? Do you have to restrict yourself to cycling on cold days with all that gear? No, it was actually very cold on that cold November day when we took the photos. 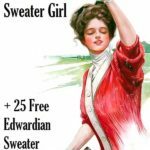 No wonder, it was advised in the Edwardian era to wear wool flannel underwear! 😀 My chemise is just cotton flannel, I think wool underwear would be warmer. What a fantastic job you did on that costume! 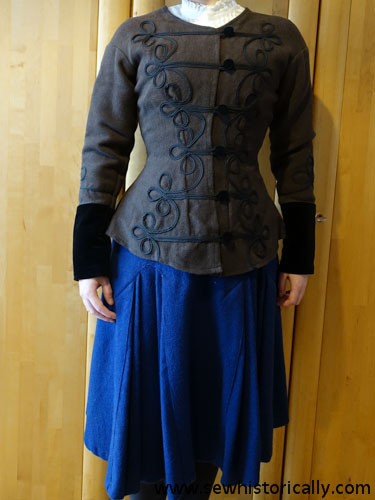 I love the jacket with all of the trim! Thanks for sharing at Home Sweet Home! What a fantastic job! Found your feature through the Charm of home!